Can you assist me in setting up a watering schedule? I have 4 zones, and I want to set up a watering schedule that works and doesn’t kill anything off. 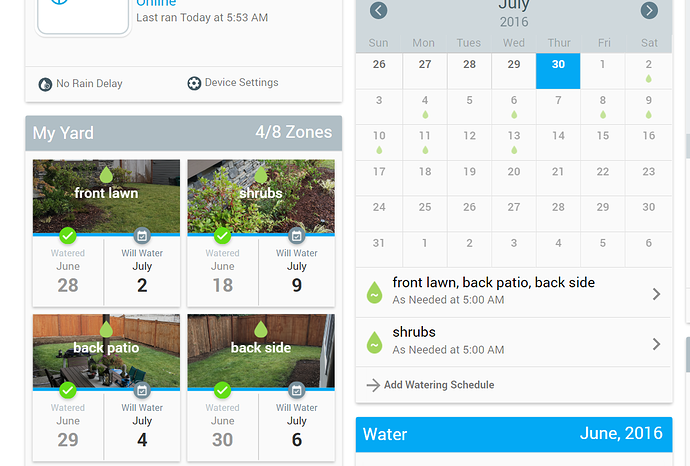 I have already set up a smart schedule to water, but my concern is that the watering schedule that has been configured automatically based on the settings provided, is using way too much water. I have small sections of grass and shrubs, and it wants to water the grass for 26 min and my shrubs for 46… I do not have any sensors either. That seems awfully long to me. I live in the northwest and have sandy loam soil. I have had two different gardeners tell me that the shrubs should be watered daily for about 8 minutes and the grass for about 12 minutes. I was wondering what your thoughts were on this and if I should use a daily schedule instead of the smart flex schedule im using. @migmon Are you running your different zones all on 1 schedule? Yes that is exactly what I was doing should I break them up? Thank you so much i will try that! You’re welcome. If you want to get more indepth with your settings, post a screenshot of your zone setup and we can go from there to see about those run times. I have had two different gardeners tell me that the shrubs should be watered daily for about 8 minutes and the grass for about 12 minutes. Are these “professionals” or just people who garden/landscape their own? Blanket statements like that are usually something you need to be careful. It’s how misinformation spreads like a weed. this is weird, I just set up a flex schedule for the shrubs and it appears there will be no watering days in july for them? oh wait i take that back… july 9th lol… i feel like it should water sooner tho? To see the details that are key to your predictions go into the zone, go down to ‘Moisture Levels’ and you should see a graph. Under that graph, select ‘More Detail’. Scroll back and forth between weeks to see the predictions. Feel free to share here. @migmon I’m surprised that 5 minutes of watering would push out the prediction that far. The Iro will not think of it as a full watering. It should record only the 5 minutes. If you share the moisture level plot with the table we can dig in further, or are you expecting 3 weeks between your shrub watering ? @migmon The moisture tables are certainly estimated, but based on many of your zone settings and weather input. As long as you know that and are comfortable with the predictions then you’re good. If you’re not then be very careful and keep an eye on your schedule as it will change from day to day, and most importantly watch your vegetation. Three weeks sounds like a long gap to me and it won’t change much just by resetting the moisture level. Of course for some climates and vegetation types three weeks might make sense.